Besides enjoying the release, we’ve kept ourselves busy with a new product update. As you may have seen by now, we spend a decent amount of time designing every experience in the workspace to respond to a real activity of the team. There are no random bells and whistles in the product. The wording and visuals clearly communicate what a certain function can do for you: in Plan you create a plan for the team, in Take Action you work on your part and in Discuss you talk together. We were pleasantly surprised to see how many people reached out to say they were waiting for it! 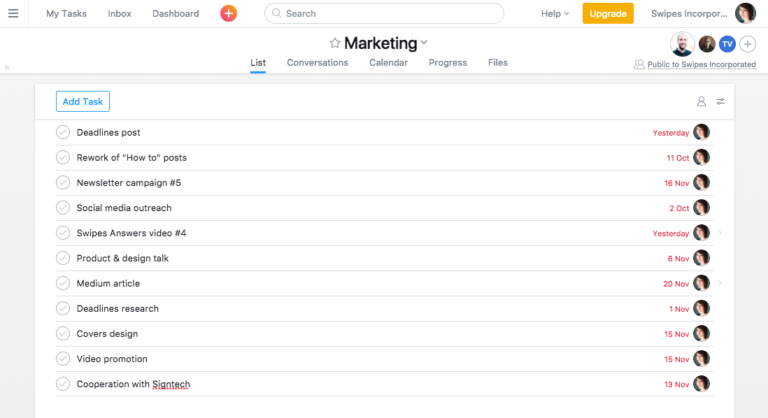 Reporting back to you, teams – Now & Later just got available on all your devices and we believe that it will change the way you align on priorities with your team! Before we jump into exploring the feature, let’s talk about the need for it. In our product, we don’t have deadlines. We understand that a lot of us think in deadlines. It’s a habit and easy way to trigger action. But we also understand how easy it is to misuse deadlines on a team level and end up in a stressful rush of catching up on unimportant things. Deadlines are not meant for priority assigning because they work with a time component rather than a “Why”. A date can only give you the information about the time by which something should be ready. It’s not expressing the most important thing for the team – Should my team and I work on it right now? At this very moment? Or not? Think about the moments when you are in the flow when you are in focus mode. These are the moments when you don’t care about time, it’s just about the work you’re doing. Unfortunately, these blissful times happen rarely to all of us. Even more so in a deadline-driven work. In such set-up, there are always bells and whistles to pull us out of the flow and remind us of a soon-to-be-due task. Another one and another one. Btw, there are more. A list of red blinking tasks (overdue) or soon approaching deadlines makes us feel in a rush and overwhelmed. Such a list does not give us any information which the most important thing for the team is now and where we are really needed. It gives us just a sense that something went wrong even though it probably didn’t. And somehow it was our fault. Such daily situations bring pressure, confusion and are destructive to the team productivity because people are forced to switch context all the time. Not to comment that it provokes people to act selfishly and not cooperatively. As a result, the pressure is high, priorities- unclear and quality is lowered in the race with time. And it’s all because a date does not contain enough information to set the team priorities straight. As toolmakers, we are very careful about bringing in new features. Not understanding the core needs of a team and just matching features because some other tool has them, could easily lead to designing systems that provoke bad habits in a team. Someone in the 90s set up a deadline-based method and we all followed blindly. Screw this! At Swipes, we think things through and bring in the latest research in teamwork to design a better system for the modern way of working. This is how we can help you foster a more inclusive work environment and give you the confidence that you and your team are doing the right thing at any given moment! So we say NO to deadlines and YES to Now & Later. There is one simple decision that brings everything in perspective – Is this something we should work on now? Or is it something we should work on later? It focuses the conversation on WHY, it works with the limited resource of time we all have and thus pushes us to think in Value Creation. In the Workspace, a team can go, set up the whole plan as before. And then decide which things are for Now. With an overview of all the goals the team can focus on, it is easier for people to compare them one versus another and set the priorities. These are the things the team should work on right away. Everything else can be moved to Later and people won’t see these goals until the priorities change and they become the important thing. By focusing on NOW and not BY WHEN, people can reach this blissful moment of flow and dedicate their attention to creating high-quality work. It takes the time it does and the results you will see will impress you. If you’re worried that the lack of a deadline, will kill productivity and slow things down, don’t. Science proves again and again that this freedom to self-organize and know the Why, get’s people more motivated to achieve their work. Besides this approach leads to more and better teamwork. Priorities are common for the team and people can help each other reach them. Everyone can decide on which goal to jump on and help with. And they can be confident that this is the right thing to do. There is no artificial competition for “me, me, me” vs. “you, you, you. Your team will be more productive and engaged. People will know for sure what to work on next and this is what matters most to the company. The focus will fall on the quality of work and feel good about the progress rather than asking questions, doing meetings and feeling bad that some date is blinking in red. This is the dead of deadlines! If you feel like us, go on and try it out! We’re sure you are going to love it! Want to try the Swipes Workspace with your team?